On Saturday, May 26, 2012 the Mountain Ridge High School Girls Softball team won the Maryland Class 1A State Championship. The Mountain Ridge Miners girls softball team is the first team in area history to finish undefeated at 23-0. 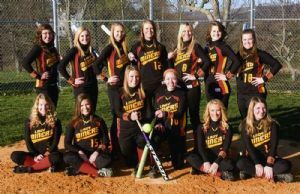 The Miners won five championships beginning with the Appalachian Mountain Athletic Conference title and including the school's first Maryland 1A softball title. Team members depicted in the photo above are, front row, left to right, Shea Hormuth, Keleigh Hunter, Taylor Llewellyn, Kaylee DeVore, Allison Hawkins and Chelsea Muir. Back row, left to right,, Kate Llewellyn, Jenna Miller, Anna Broadwater, Shae Winner, Carlie Lewis, Emma Baker and Amanda DuVall. Martha Mauzy served as the head coach of the 2004 Beall High School State Championship team, as well as the 2012 Mountain Ridge High School State Championship team. Allegany (1999 and 2010), Beall (2004), Fort Hill (2008), and Mountain Ridge (2012 and 2013) are four Allegany County high schools that have won the MPSSAA (Maryland Public Schools Secondary Athletic Association) State Girls Softball Championship.